Not a sight we’re used to! 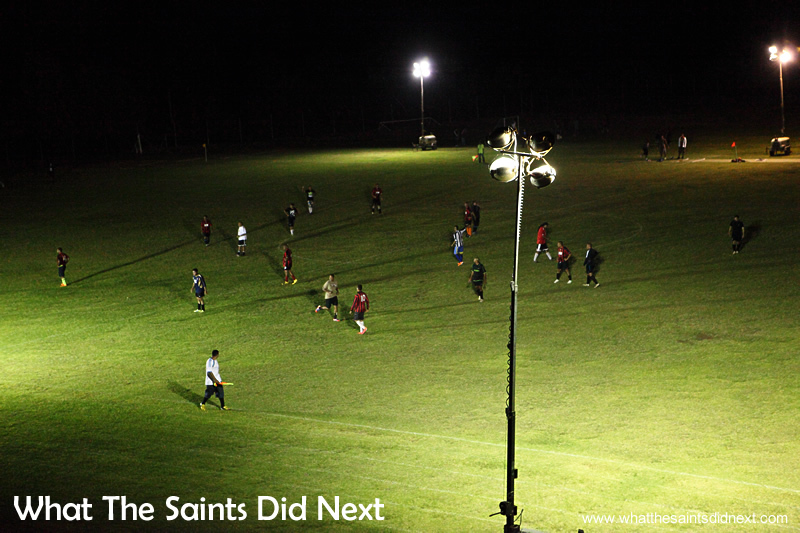 Football on St Helena under floodlighting. This is a new look for Francis Plain. 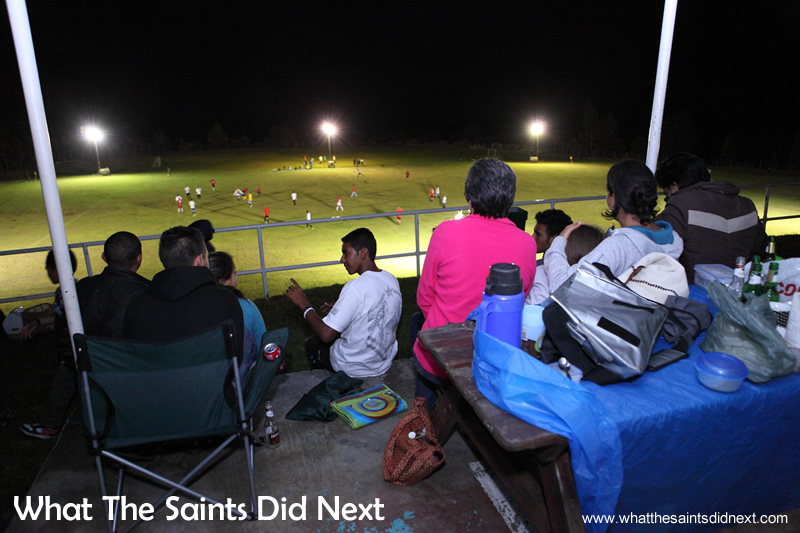 Curiosity ensured a large turnout for St Helena’s first ever football match under floodlights. The car parks were full. We estimated 300 people, although most observed from the dark perimeter, out of reach from the lights, which made it difficult to appreciate their numbers at a glance. 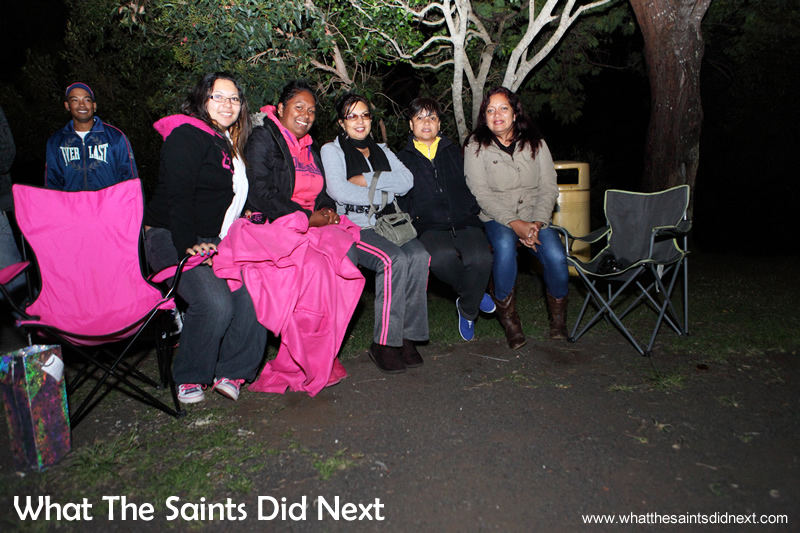 Ok, not a big deal you may say, 300 people; but on St Helena that’s about 7% of the population. It would be like 3.7 million turning up to watch a game in England. 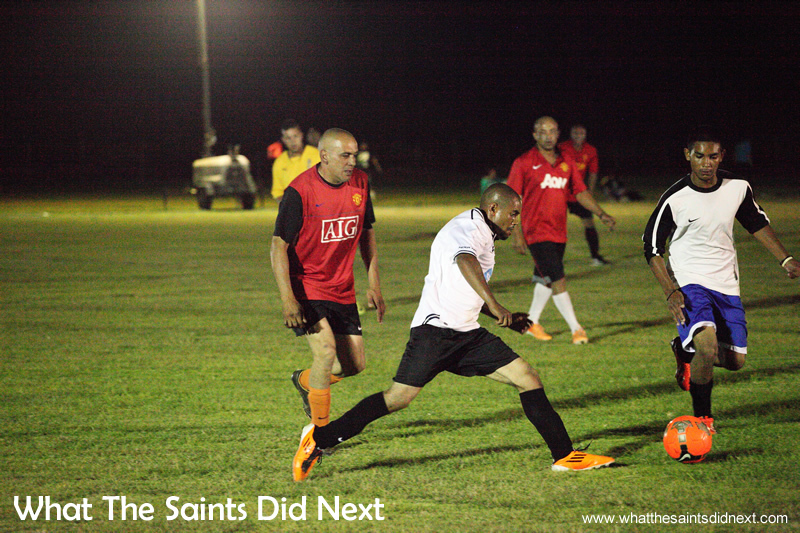 Not quite a Champions League setting, but still a big event for St Helena Island. The 8pm kick-off became 9pm, but no-one seemed to mind. The date was 2 January, 2015, a Friday night. The lull of Christmas holiday season was still in effect, everyone was in a more laid back state of mind than normal. And this had the feel of an entertainment event rather than a sporting fixture. In fact, the normal football season wouldn’t even start for another four months. This was a match for fun. 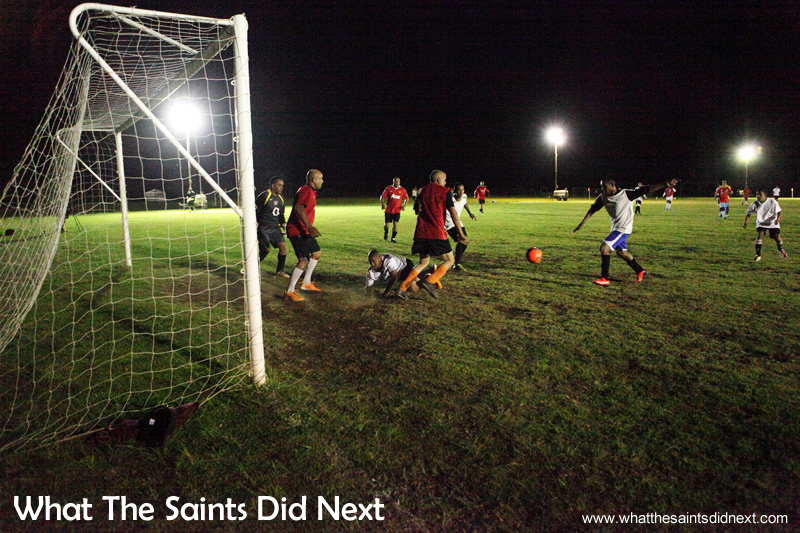 Night time football on St Helena. There had been a warm up game earlier (which also started late) but this now was ‘the’ match. The warm up game began in daylight but as that faded it was clear the lighting needed improving. Extra lighting rigs were brought in. Spectators continued to sit and wait patiently while a group of players fiddled about positioning the lights and setting the beam angles. The actual lights were on loan from the airport contractors. They were construction site generators on wheels designed to be towed by a vehicle, with an extendable mast that held four large, bowl shaped lights. 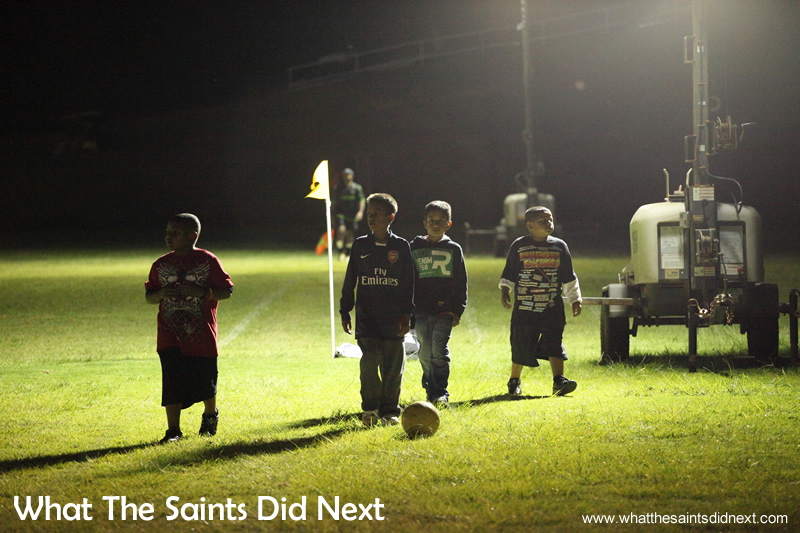 Six of these generator sets were positioned around the field, glaring down onto the playing surface. One or two of the lights had a distinctly yellowy, orange glow. Just watching the men setting up the lights helped pass the time; all part of the show. A ratcheted handle slowly brought the lighting mast up from its horizontal transporting position, then a second handle extended the length upward. The slow upward extension came with a piercing screech of metal scraping metal, minus lubricant. Fiddling with the lights. 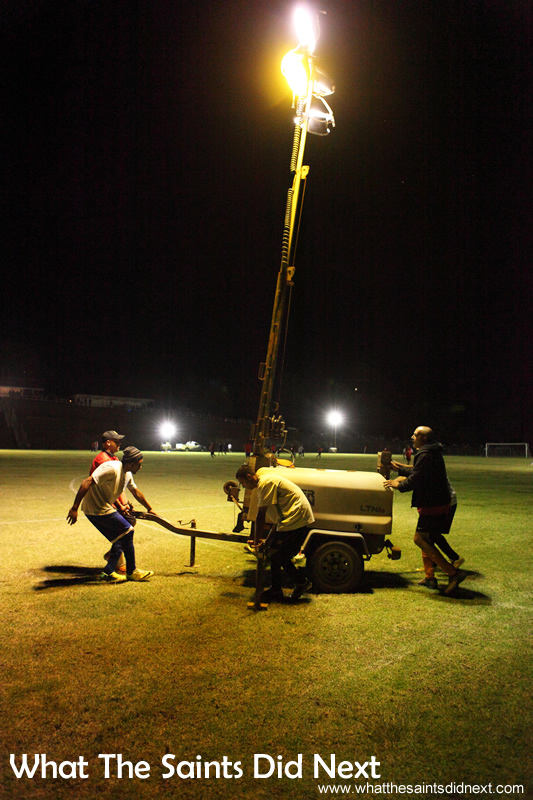 The players all involved with setting up for night football on St Helena. 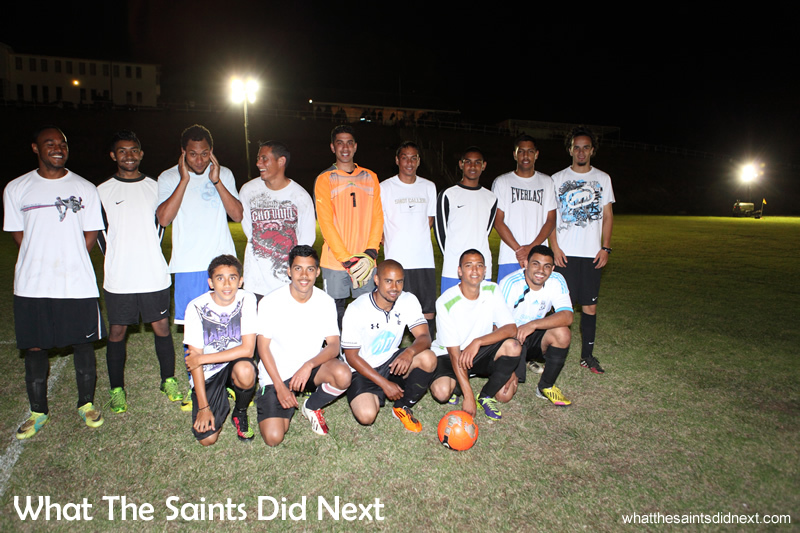 Making history, the Under 25s team for the first night football on St Helena. 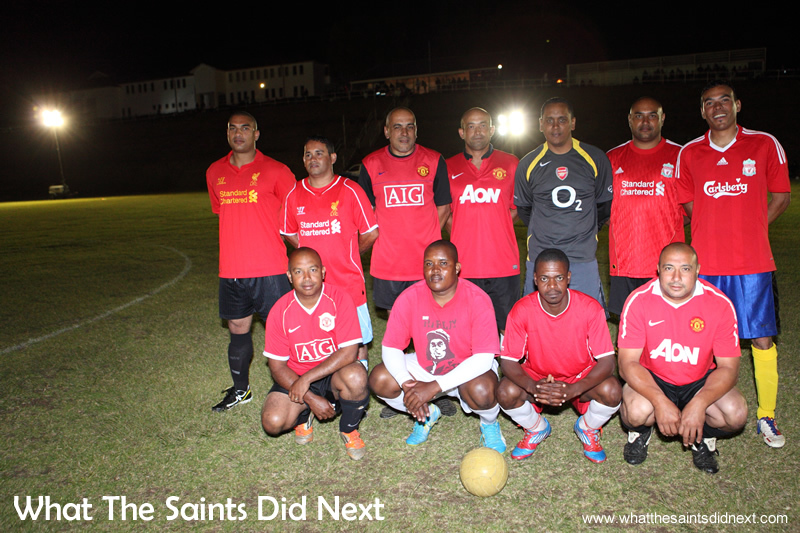 The over 35s team for the first football on St Helena under floodlighting. And then, finally, the game began. 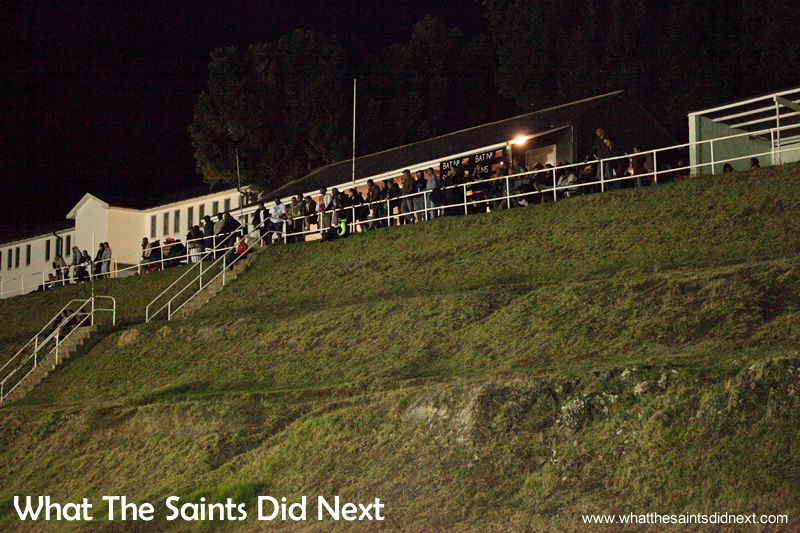 Night Football On St Helena, Here We Go! In truth the lighting wasn’t quite adequate, a few of the spectators agreed that it was a little difficult to see who was who. 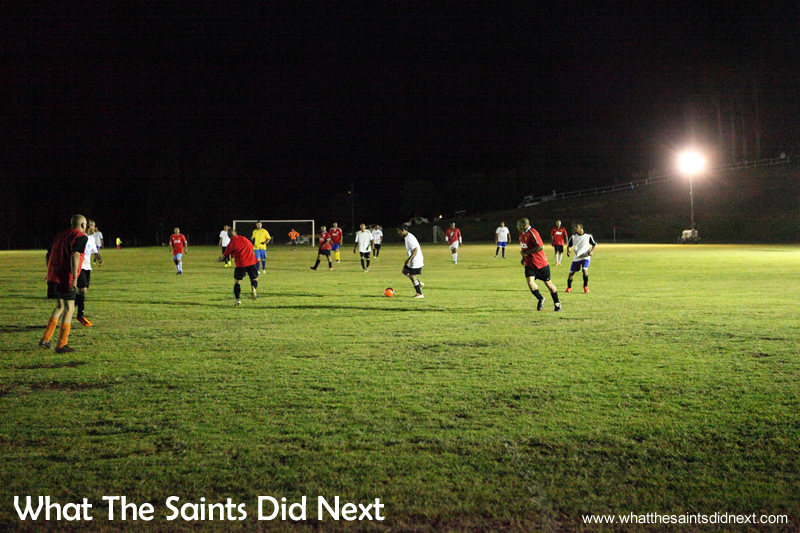 Hotspots of light pooled around the touchlines, but in the middle of the pitch it was noticeably darker. 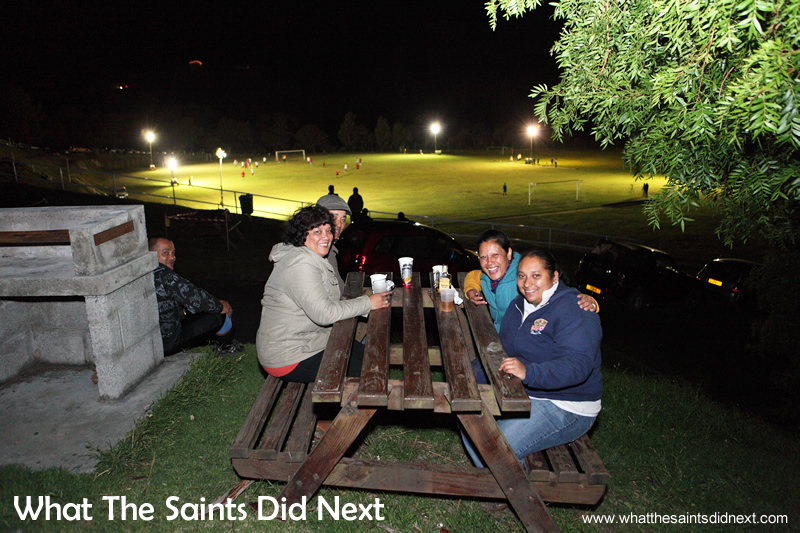 But it didn’t matter really; this was special; this was night football on St Helena. Whoo hoo! Unbelievably a dark blue ball was used to begin with. Standing just behind the goal with my camera while a corner was being taken, I asked one of the players why they weren’t using the orange ball. There was a vague response, but shortly afterwards the blue was substituted for the orange. That must have been the first time on St Helena a high vis ball was necessary. The teams were an all-stars line up of under 25 year olds versus over 35s. Kit instructions had clearly been, “wear something red,” or “wear something white.” An assortment of English Premiership replica shirts were on show, including Manchester United, Liverpool, and Tottenham. The youngsters (under 25s) escaped embarrassment and won, but only just, the game finishing 2-1. For the history books, goals came from Shane Stroud and Rico Benjamin with the older team’s strike coming from African contractor, Joseph Hlongwane (nickname: Ace). A scramble in the box leading to the first goal. Wear something red. Wear something white. 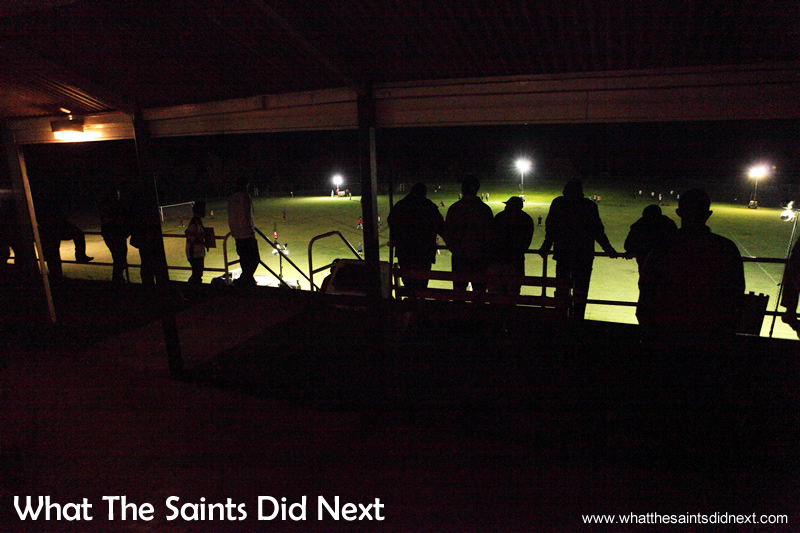 Football on St Helena under floodlighting. As for the game itself? For three seasons I had reported football on St Helena for The Sentinel, but this was completely different. The game was strangely secondary even though both teams were obviously trying to win it, but I can’t say I registered much about the play. The details of the game, the passages of play and the individual performances that normally hold my attention were replaced by a fascination of the occasion. 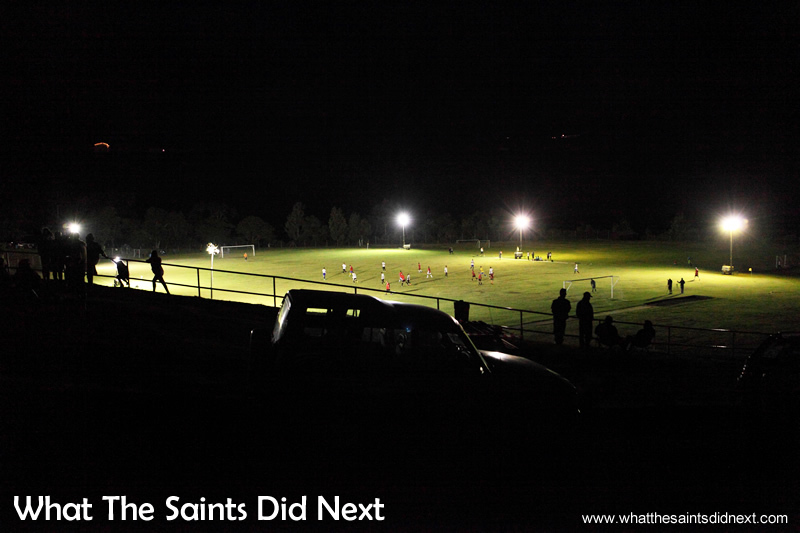 This was Francis Plain, in the middle of the night, lit up for a football match. 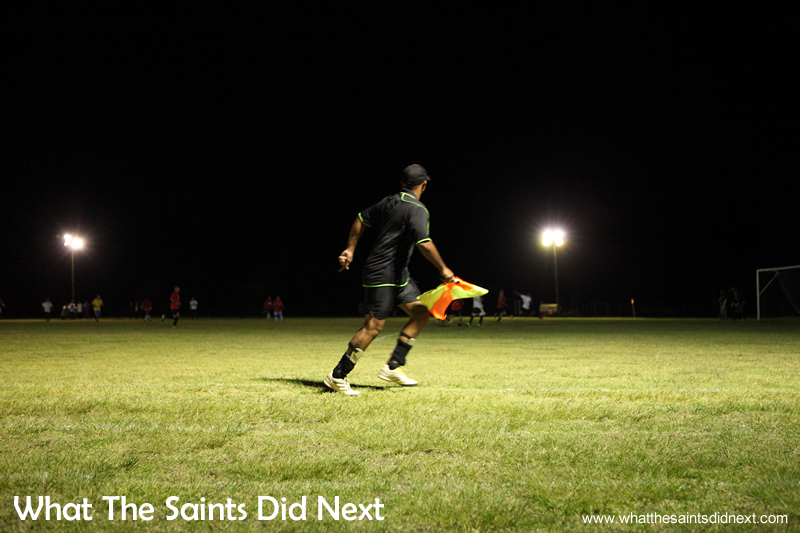 I had played football under floodlights for years on Ascension Island and even been to a couple of English Premiership matches at night; even so, it felt like the first time. That night, things other than the game, stuck in my head. The hum of the six generators around the field keeping the lights shining. They weren’t particularly loud, but enough so that at pitch-side they drowned out the shouts and cries from the players. What was noisy was the reggae music pumping out from the top of the terrace stand. Was that too loud? I must be getting old! There was a full moon which outlined the distant hillsides. Photography was a challenge. Very high ISO (5,000) and low shutter speeds, quite different to shooting football on a Sunday afternoon. I took a walk around the darkened, outer reaches where spectators were hidden away sitting on the grass, in fold out camping chairs or even in their vehicles. Flasks of tea (or coffee) were helping people enjoy and celebrate the occasion. In contrast, Jack Daniels whiskey and Captain Morgan spiced rum was the chosen beverage for a few of the crowd. There were a few blankets on show to ward off a tinge of chill. Young children, taking advantage of the light spillage, were playing near the pitch, also enjoying the novelty of sport outdoor, at night. I don’t think there was any master plan behind the game. The idea had been talked about for some time, so it was really just an experiment. But the visual of what really is possible will now be firmly embedded in the minds of those who were there. 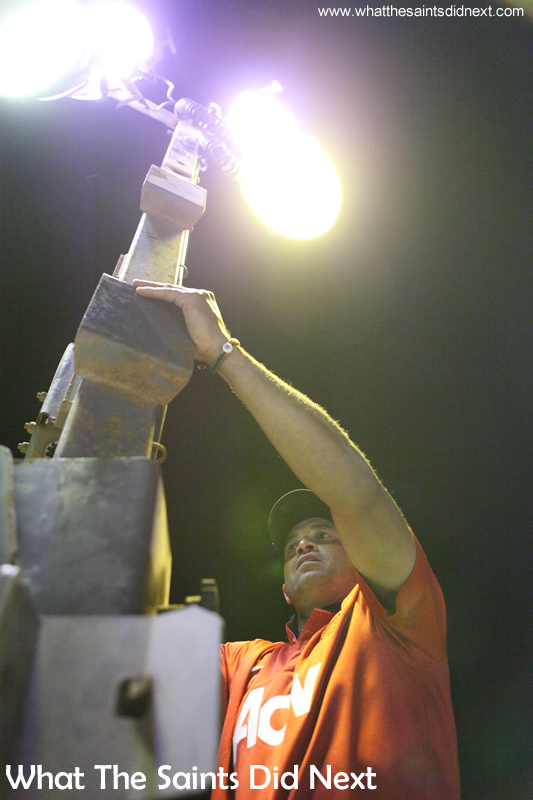 Permanent floodlight installation can’t be that difficult, can it? In recent years, the football seasons have been disrupted by flooding during the rainy months, perhaps this may be a solution allowing the cricket and football to both share the summer months.